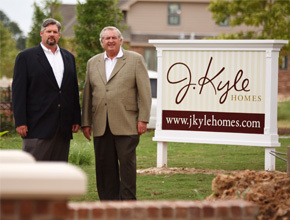 J. Kyle Homes learns certain information about you from your visit to our site, and what we do with this information depends on what you do when you are visiting the site. This policy explains the uses we currently make of this information. This policy lets you know what choices and security you have with respect to information J. Kyle Homes collects. Unless you complete one of the information forms, send us an e-mail, or use other products and services that are or will be available on J. Kyle Homes web site, we collect and store only the following information about you: the domain from which you accessed the Internet, the date and time you access the site, and the pages you visit most frequently. This information is not linked to a user name. We use the information to measure the number of visitors to various portions of our website and to help us improve our service. If you do complete one of the information forms, send us an e-mail, or use other products and services that will be available on J. Kyle Homes web site, we will collect and store the information you enter. Obviously, what we collect depends upon what you enter. We reserve the right to keep all information in an off-line form, for archival purposes or as otherwise required by law.